My study of the Japanese language is a stop and go process but I have been making a lot of progress lately. On the reading side so far I am confident of my Hiragana and Katakana knowledge and have been practicing recognizing more and more Kanji starting with the first year elementary school ones off the JLPT4 list. There are a myriad of text books, software, websites, tools, games and other resources offering to help you learn Japanese and although that is a good thing sometimes you can get swallowed when you have have so many options. That is exactly what has been happening to me lately but I have discovered a very useful Japanese educational game and reviewing tool called NihongoUp. NihongoUp is an application that runs on Windows, Mac or Linux that assists persons learning Japanese by helping them to retain what they have studied. If practicing Hiragana or Katakana users type the meaning of the character on screen while in the case of Kanji or particles users choose the right answer from the multiple choice list. Many Japanese learning resources advise persons interested in Japanese to learn Hiragana and Katakana (together called Kana) as the first step. I have to agree and also add that it best to stay away from romanji (romanization of Japanese into the western alphabet). Kanji is the mainstay of the Japanese writing systems and are heavily influenced by Chinese. Most Kanji are more complicated than Kana ranging from 1 to 20+ strokes. Particles in Japanese can be very tricky and this is where NihongoUp has been and will be ever more useful for me as I use it to practice Japanese. Do you know which Kanji should replace the Hiragana character in the example above? My first reason for liking NihongoUp is how simple, quick and easy it is to install. After installation you can jump right in by adjusting audio, game duration and more on the settings page and getting instructions on the different type of games by clicking help. When ready just click game and then choose what you would like to practice at that time whether it be Hiragana, Katakana, Kanji or particles. Only JLPT level 3 and 4 Kanji are available for practice currently but the game will be updated soon with higher level Kanji. I usually have NihongoUp open while browsing the net at home or going about my computer related work duties at work, when taking a break I just click over to the program for a quick refresher and then I go back to what I am doing. 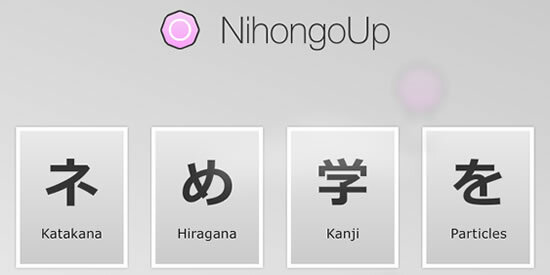 NihongoUp is an accessible learning tool that will help users to retain the Japanese they are studying, it’s ease of use and fun lessons does a wonderful job of combining learning and entertainment. It is definitely worth a free trial and if you like it NihongoUp it can be bought for the very reasonable price of $4.99 which also gives you access to all future updates. Want to win a copy of NihongoUp? Are you like me and trying to learn Japanese, no matter what your method of study is be it via formal classes, using online resources or a combination of both NihongUp is a excellent reviewing and practicing tool. Even if you are at a high level, speak and read Japanese well this software can help you learn more and retain the Japanese you already know. Look out for a competition I will be having starting this coming Monday for information on how you can win 1 of 5 licenses for the full version of NihongoUp. Thank you for the tip. It is a very good program for practicing. I really enjoy it for the speed that it encourages to respond with. Really good for your typing skills. Dude, my head hurts reading that. All the Japanese words. Cool game though. Interesting. Will download it later. From a Mexipanese to a Jamaipanese, thanks for the excellent suggestion. I’m learning Japanese too and even tough my grasp of both kana systems is far better than some weeks ago, I was in desperate need of offline tools for learning. Right now I’m immersed in the study of basic kanji thanks to a great book, but I need an effective offline exercise tool. Hopefully this will do.